When emails are sent via the Communications tab or Approve Faculty Input, a progress indicator will display. 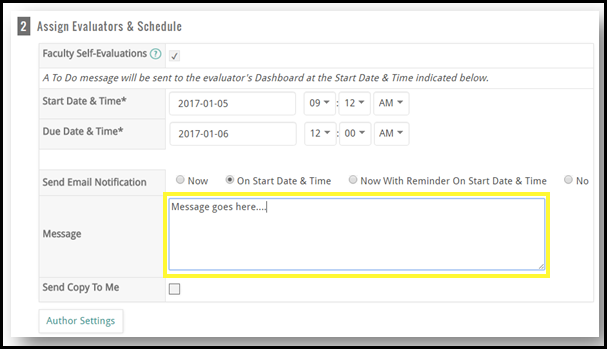 When creating a new evaluation process, the option is now available to copy evaluators from a previous process to the new process. The previous evaluation process will be available for selection under the heading Copy Evaluators from Previous Process. The system will match evaluators for each step and unit. If the steps have been modified no evaluators will be copied for that step. Note: Copying evaluators requires sending of notifications to users from each evaluation page. The ability to add a filter for each Activity Classification for all Vita Display styles is now available when configuring a vita template. 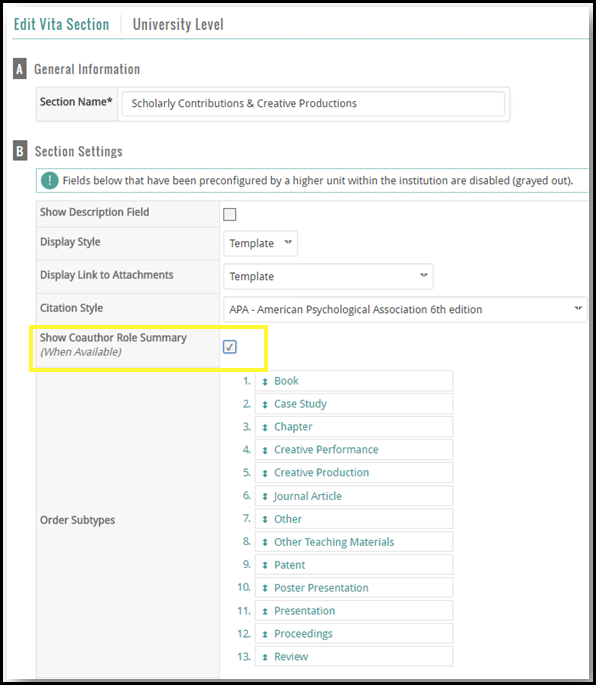 It is also possible to group by sub-type for a Traditional Style vita in the Scholarly Contributions and Creative Productions section. 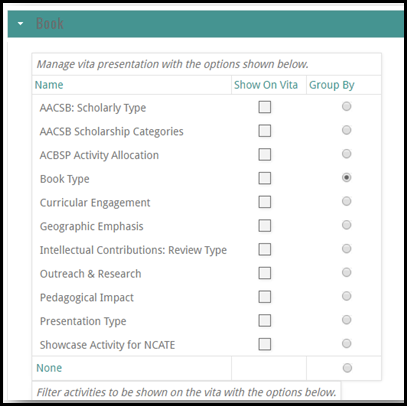 For example, for a traditional vita the vita could be grouped by Book Type for the Book sub-type and then grouped by Review Type for Journal Articles. Navigate from the Admin tab to Configure>Vita>select a vita. Edit the Scholarly Contributions and Creative Productions section. Settings are available for each sub-type. Select the desired options for each sub-type. Navigate from the Admin tab toSetup>Vitas(under Configuration). Select the vita you wish to edit and then click the Edit icon. Scroll to the Scholarly Contributions and Creative Productions section. Click the edit icon for the section. The section settings display. The new option is titled Show Coauthor Role Summary. Check this option to include a coauthor role summary count in the citation. Harris, Scott K., (Author), Sharon Chair (Author), and John Doe (Student). Book 7917. Edited by Bill Chair and Frank Chair, 2016. From theAdmin tab, select Administration>Activity Input>Approve Faculty Input. 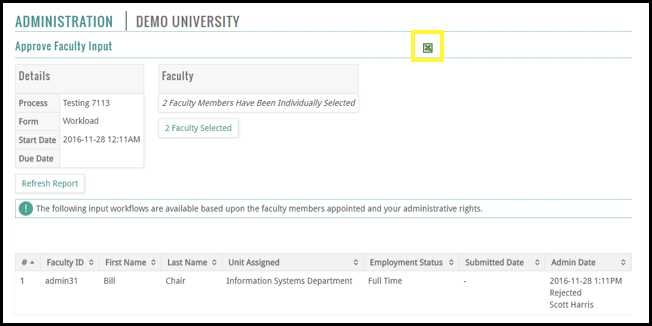 Click the view icon for the desired faculty input. The faculty input displays. Click the view icon for the desired unit. The details display. Click the Excel icon at the top of the page to download the report to Excel. Clicking the Accept button returns the message below. For clarification purposes, the button is now titled Okay (previously titled Cancel).